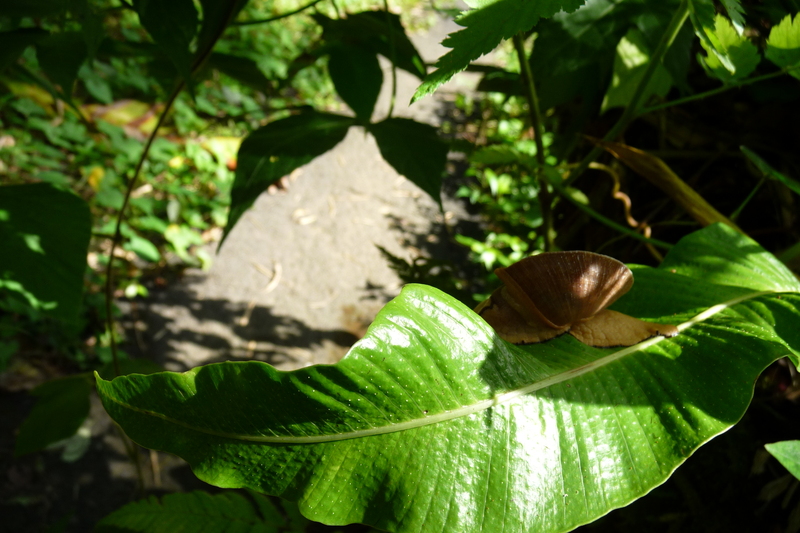 This is a very artistic picture of a snail ‘meeting’ near Polo, Dominican Republic, with Coloniconcha prima Pilsbry, 1933 as the star player, who is clearly in a hurry. 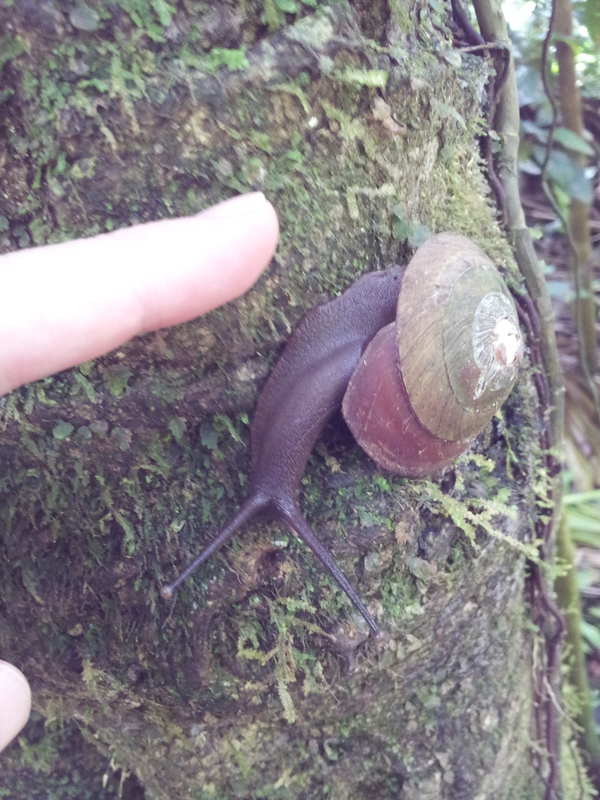 According to Ignacio Agudo the other snail is Cysticopsis sp. He gave as photographer Carlos de Soto Molinari. This entry was posted in Uncategorized and tagged Helminthoglyptidae, pleurodontidae, West Indies on May 2, 2017 by bramb. In the cloud forests of the western Cordillera in Colombia, a nature reserve – “El Refugio” – is located along the road Cali-Buenaventura. This privately managed reserve has 14 ha of primary forest and 4 ha of secondary forest and gardens. 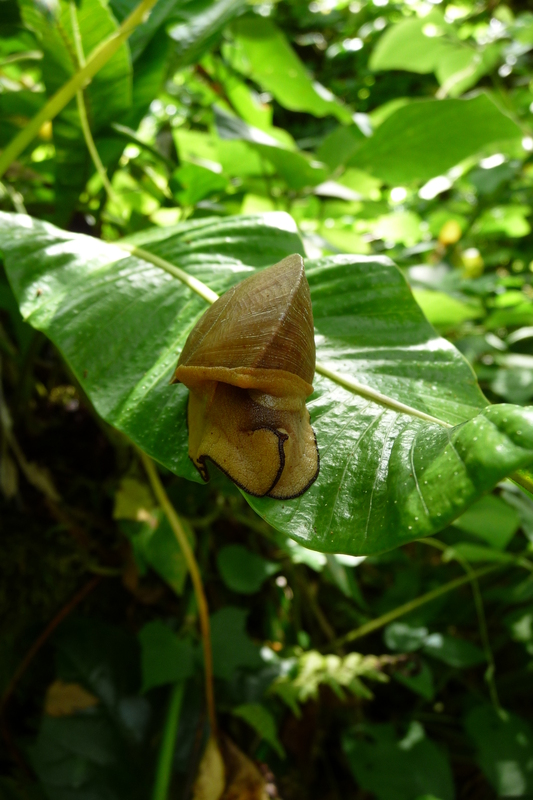 The website (http://elrefugionatura.jimdo.com) provides a wealth of information on the different plant families that may be found here, as well as a small gallery with photos of living snails that have been encountered. The Drymaeus species pictured is actually D. (D.) zingarensis Restrepo & Breure, 1987. This entry was posted in Uncategorized and tagged colombia, cyclophoridae, drymaeus, hemibulimulus, pleurodontidae on May 24, 2013 by bramb. The Venezuelan tepuis have long been a mysterious place and geologists only recently have begun to explore the caves inside these mountains made up by sandstones. Some years ago geologists and speleologists from Czech and Slovakia set out to Chimantá massif, together with local counterparts. They explored the immense caves that are present and brought several novelties for science home. Among them some snails, collected on special request. 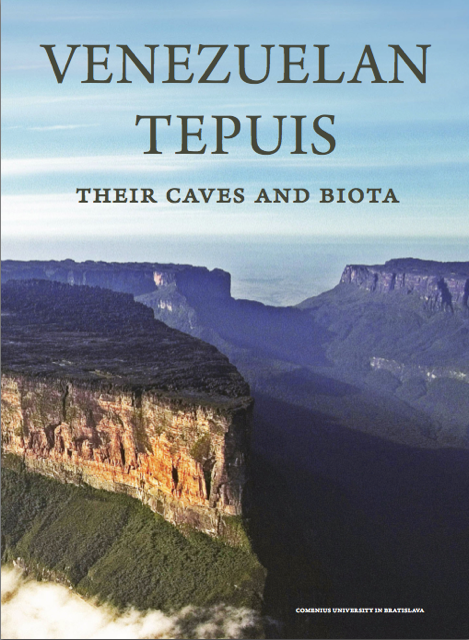 Now the scientific results have been compiled in a book: Venezuelan tepuis – their caves and biota (Aubrecht et al., 2012). Originally scheduled for end 2011, officially dated for 2012, it only now appears in 2013. Thanks to the determined editors, Roman Aubrecht and Jan Schögl, they succeeded in the end. A paper version of the book will appear “later (perhaps in March)“. This book contains parts on Cave systems in Churí and Roraima tepuis, and Faunistical investigations of Pantepui biogeographical region. The chapter on the malacofauna is a review of all known species, with new data on the anatomy of some and phylogenetic results on Plekocheilus species. Aubrecht, R., Barrio-Amorés, C.L., Breure, A.S.H., Brewer-Carías, C., Derka, T., Fuentes-Ramos, O.A., Gregor, M., Kodada, J., Kovácik, L., Lánczos, T., Lee, N.M., Liscák, P., Schlögl, J., Smida, B. & Vlcek, L., 2012 . Venezuelan tepuis – their caves and biota. – Acta Geologica Slovaca, Monograph, Comenius University, Bratislava: pp. 1-168. Available at http://geopaleo.fns.uniba.sk/ageos/archive/monograph/aubrecht_et_al_2012_monograph.pdf (NB: 163 Mb). Breure, A.S.H., 2012. Living in isolation: Plekocheilus (P.) philippei spec.nov. 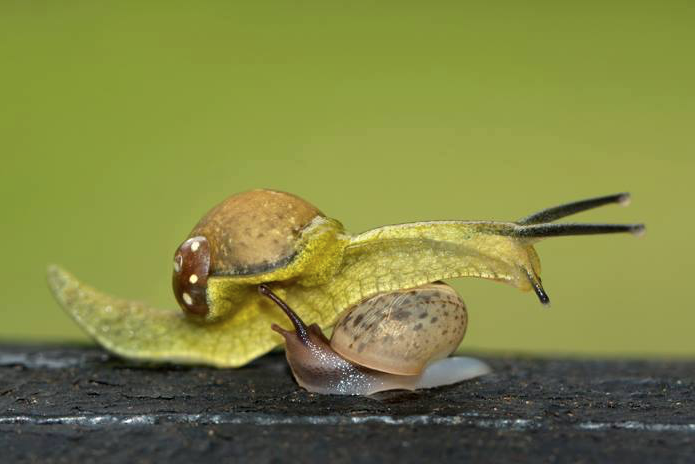 from Venezuelan Guayana (Gastropoda, Amphibulimidae). – Basteria 76: 101-106. This entry was posted in Uncategorized and tagged clausiliidae, drymaeus, phylogenetics, plekocheilus, pleurodontidae, publications, venezuela on February 23, 2013 by bramb. Traditionally the end of the year is ‘harvest time’ for papers. 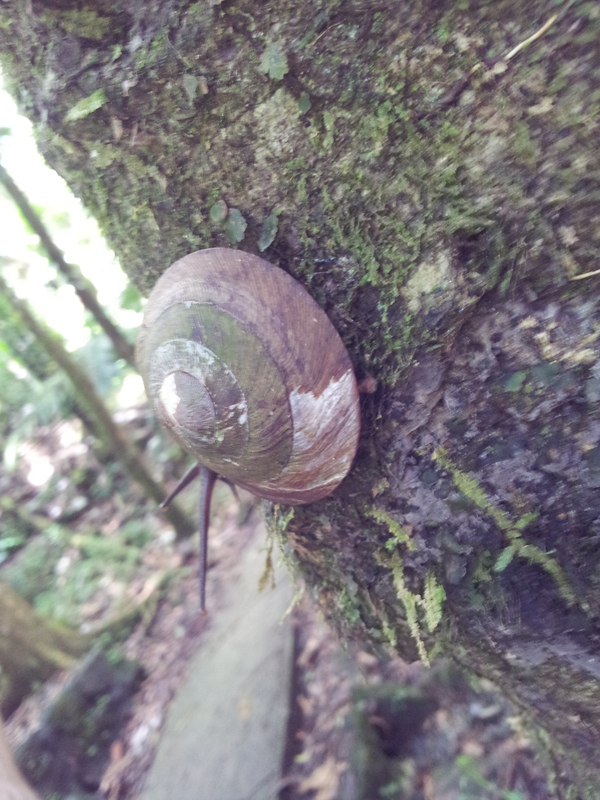 A new paper just appeared on the Pleurodontidae from the Sierra Nevada de Santa Marta, Colombia; more papers on Neotropical snails are in the pipeline. The new paper by Borrero is a thorough revision of the species from northern Colombia, based on museum collections and field work. Six already described new taxa were recognized in the material, while one new species is described: Isomeria goettingi from Dept. Magdalena, San Lorenzo, 2600 m. Holotype SMF 329554. Borrero, F.J., 2012. 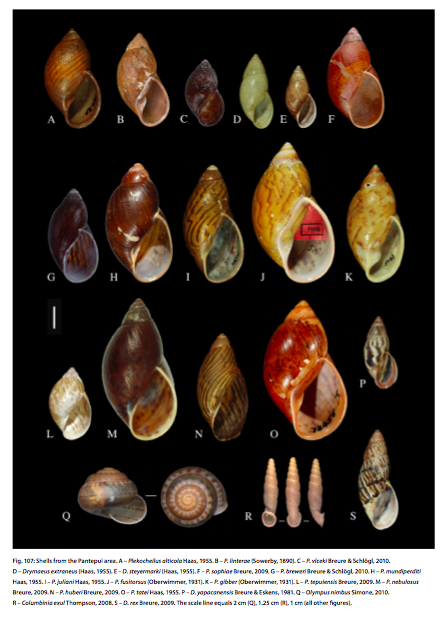 A re-examination of the Pleurodontid land snails from the Sierra Nevada de Santa Marta region, Colombia, with the description of a new species of Isomeria Albers (Gastropoda Pulmonata: Stylommatophora: Pleurodontidae). – Archiv f? ?r Molluskenkunde 141: 217-231. This entry was posted in Uncategorized and tagged colombia, literature, pleurodontidae on January 7, 2013 by bramb.